The center owns 160 beds located in 3 buildings. Each room is equipped with private batrooms and are very comfortable. Beds are new. Rooms are dotted with wardrobes, and are separated to allow parents and children to be on their own. The center has recently been fully renovated and offers a comfortable place to enjoy nearby the ocean. 12 bedrooms including 2 to 7 beds in duplex, each with a bathroom, with a view on the sea or the swimming pool. 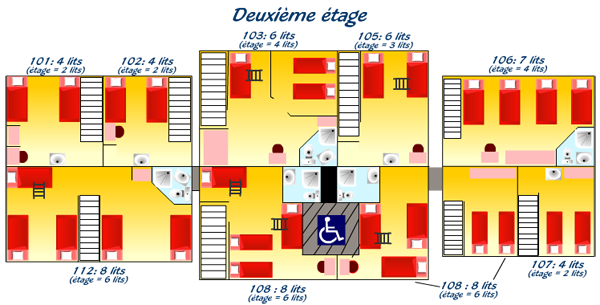 4 bedrooms with bathrooms for disabled people. Access by lift. 5 chambres duplex (de 28m2 à 35 m2) pour 5 à 7 personnes : 1 chambre parents avec 2 lits simples et 1 salle de bain avec wc, 1 chambre enfants avec lits simples ou superposés. 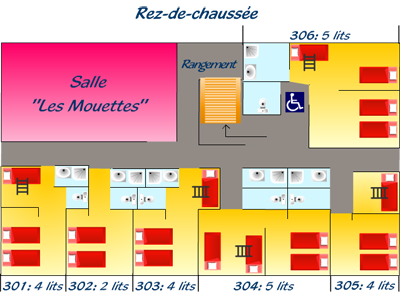 (dont 1 chambre sans séparation parents /enfants) - 2ème salle de bain avec wc dans certains duplex. 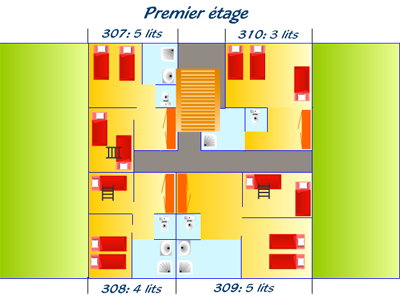 3 chambres duplex (de 28m2 à 35 m2) pour 4 personnes : 1 chambre parents avec 2 lits simples, 1 chambre enfants avec 2 lits simples ou 2 lits superposés, et 1 salle de bain avec wc. 10 bedrooms including 2 to 5 beds ( one room dedicated for disabled people) and each dotted with a bathroom. Each bedroom on the ground floor overlooks the swimming pool. Each separate room is very comfortable, equipped with a bathroom. 2 chambres de 2 personnes (28 m2) : 1 chambre parentale avec 2 lits simples, sanitaires complets. 5 chambres de 4 personnes (35 m2) : 1 chambre parentale avec 2 lits simples, 1 chambre enfants avec 2 lits superposés, sanitaires complets. 3 chambres de 5 personnes (35 m2) : 1 chambre parentale avec 2 lits simples, 1 chambre enfants avec 1 lit simple et 2 lits superposés, sanitaires complets.